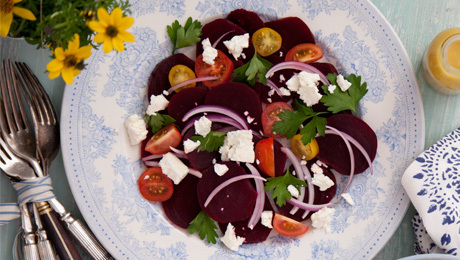 A perfect salad for summer dining! Place the beetroot in a saucepan of boiling water; ensure that every part of the beetroot is full submerged in water. Allow to boil for 20 -30 minutes until the beetroot is tender. When the beetroot has cooled, thinly slice and set aside. Place the pine nuts into a frying pan over a low heat and toast them, adding the honey as they begin to brown. Ensure that all nuts are coated in the honey & set aside to cool. To make the dressing. Combine the balsamic vinegar, juice & olive oil in a bowl, season with pepper. In a large salad bowl, combine the salad leaves, onion & tomatoes. To assemble, place a generous helping of the salad mix into a serving bowl, place the sliced beetroot on top and crumble on the goat’s cheese. Scattered the pine nuts on top for some extra crunch and drizzle on the salad dressing.